From the Wetterhorn in 1854 to the Matterhorn in 1865 - from triumph to tragedy - the Alps were conquered in a decade. It was what Reverend W.A.B. Coolidge called the 'golden age of alpinism', the era of the first great guides (Christian Almer, Melchoir Anderegg, Michel Croz) and gentlemen climbers (Leslie Stephen, John Tyndall, Edward Whymper). Almost all European Alpine clubs were founded during this period, crowned by the successful ascents of the Aiguille Verte, the Matterhorn, and the Brenva face of Mont Blanc. Summits were no longer scaled in the name of science, but for the beauty and difficulty of ascents that embodied the pleasure of the 'noble sport' of mountaineering, as invented during this golden decade. 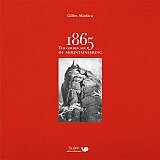 1865: the Golden Age of Mountaineering, by Gilles Modica, documents this great time in the history of alpinism. Illustrated with 350 photographs and illustrations and lavishly produced, it is co-published in English and French by Vertebrate Publishing and Editions Paulsen.